The doctrine of the Imperial Japanese Navy after the victory against the Russian Fleet was also based on a decisive surface battle. This battle should be perform by means of a strong strike force, which was known as an “eight-eight fleet” composition. The eight-eight fleet was defined as an eight first-class battleships and eight armoured cruisers or battlecruisers. In this context, the construction plans envisioned a series of four battlecruisers that were known as the Amagi-class. The names of these ships were decided in advance as follows: Amagi, Atago, Akagi and Takao. These battlecruisers were also inspired by a previous battleship design called Tosa-class. Mutsu Battleship constructed under the eight-eight fleet doctrine. The construction started in 1920, however, because of the Washington Naval Treaty and the limitations imposed to Japan by USA and Britain, the works had to be stopped. Nevertheless, this opened the possibility to used the hulls under construction to build new aircraft carriers. The ships which had progressed more in their construction were selected for that purpose. The Amagi hull suffered from severe damaged due to an earthquake, therefore had to be scrapped. However, the Akagi could entirely used to build the Akagi carrier, which would be the flagship of the Combined Fleet and led the Pearl Harbor attack. It is worth mentioning that years later, a new Amagi was built this time designed as fleet carrier. The Unryu-class was composed of three carriers, being an improved version of the Hiryu-class. The Amagi, Unryu and Katsuragi. They, however, were built too late and the war was already lost. The remaining two names, Takao and Atago, were used to name two heavy cruisers built later for the IJN. This unfinished battlecruiser, even though it did not sail nor participated in any conflict, attracted the attention of the model manufacturers and recently it is possible to construct replicas of the ship at 1700 scale. 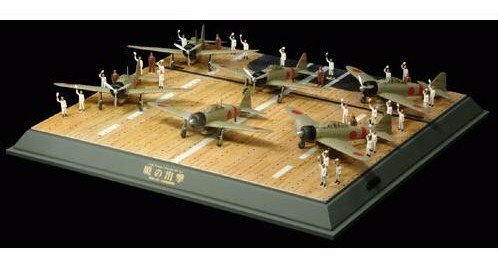 See for example the following model by Fujimi. Amagi Battlecruiser by Fujimi at 1/700.